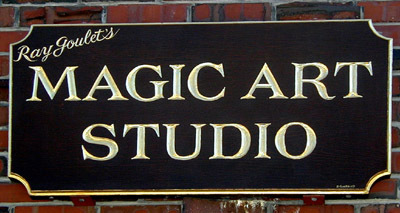 The sign at the former Magic Art Studio on Spring Street in Watertown. A small museum of memorabilia, books and other items related to magic and magicians was located for years in a storefront on Spring Street in Watertown. This month, items from the Mini-Museum of Art will be sold at auction. The Magic Art Studio, run by Ray Goulet, has closed and items will be sold at an auction in Chicago, but bids can also be submitted online or by phone, according to the Potter & Potter Auctions website. Among the collection are items owned by by Harry Houdini, a first edition presentation copy of Harry Kellar’s A Magician’s Tour, and many other prints, cards and magic apparatus. The sale will be held on Saturday, April 27, 2019 starting at 11 a.m. Eastern at the Potter & Potter Auctions gallery, located at 3759 N. Ravenswood Ave., in Chicago. Click here to see more information. This is such a shame. I know how much Ray loved his collection! I loved to hear all his stories about when he use to perform!